Extreme heat in 2016 damaged Australia’s Great Barrier Reef much more substantially than initial surveys indicated, according to ongoing studies that have tracked the health of the coral treasure. 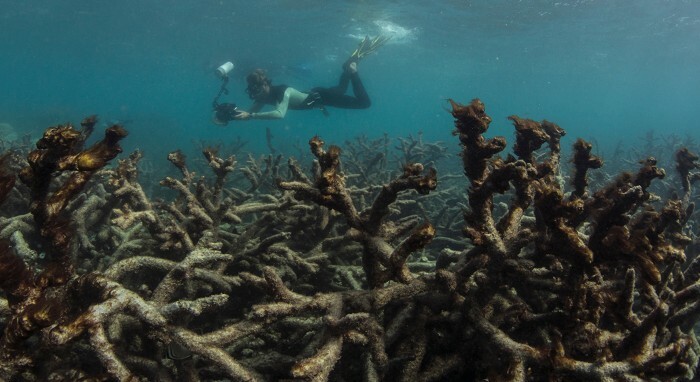 The heatwave caused massive bleaching of the corals that captured worldwide attention. In a paper published on 18 April in Nature, researchers report1 that severe bleaching on an unprecedented scale triggered mass death of corals. This drastically changed the species composition of almost one-third of the 3,863 individual reefs that comprise the Great Barrier Reef. Hughes and his team of ecologists closely examined the 2,300-kilometre Great Barrier Reef after the 2016 heatwave. 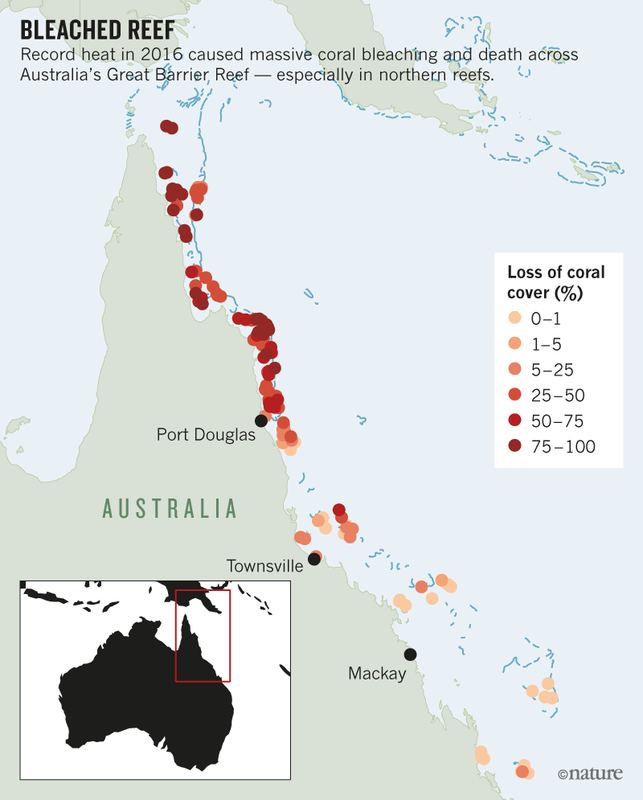 Extensive aerial surveys revealed widespread coral bleaching between March and April 2016. This phenomenon occurs when excessive heat kills or expels algae called zooxanthellae, which have a symbiotic relationship with reef-building corals. The algae provide the corals with energy and nutrients from photosynthesis;﻿ without them, the corals often die. But to gauge the full extent of heat damage, Hughes’s team conducted more-comprehensive underwater surveys of coral mortality, both at the peak of the observed bleaching in March and April, and again eight months later. Many corals — especially those in the northern third of the reef — died immediately from heat stress. Others were killed more slowly, after their algal partners were expelled. The composition of coral assemblages on hundreds of individual reefs changed radically within just a few months of the heatwave. On severely bleached reefs, fast-growing coral species — which have complex shapes that provide important habitats — were replaced by slower-growing groups that shelter fewer sea creatures. “The study paints a bleak picture of the sheer extent of coral loss on the Great Barrier Reef,” says Nick Graham, a marine ecologist at Lancaster University, UK. Approximately one-third of the world’s coral reefs were affected by bleaching in 2016. On the Great Barrier Reef, less than 10% of reefs escaped with no bleaching, compared with more than 40% in previous bleaching events. “It is now critical to understand how governance and local management can maximize recovery between recurrent heatwaves,” Graham says. Tim McClanahan, a conservation zoologist at the Wildlife Conservation Society in Mombasa, Kenya, says the study’s findings might not predict how other reefs will cope with a warmer world. Responses might depend on the corals’ life histories and local environmental conditions. “Global warming will result in more heat-stress events,” he says, but “there is accumulating evidence that corals do acclimate”. Global coral bleaching had been observed just twice, in 1998 and 2002, before the extreme 2016 incident. Coral colonies can recover from such events, especially given that the species most susceptible to dying from heat stress are among the fastest-growing corals. But harmful warming events are occurring more frequently, and scientists think that full recovery is becoming increasingly difficult2. Researchers have also found that local protection of reefs and surrounding waters does little to make corals less sensitive to heat3. Rather, global changes such as ocean acidification might further increase environmental stress. The fate of tropical coral reefs — including the iconic Great Barrier Reef — therefore depends on efforts to mitigate climate change, says Graham. “A future with coral reefs, their rich diversity and the livelihoods they provide to people is quite simple. It will only be possible if carbon emissions are rapidly reduced,” he says. Hughes, T. P. et al. Science 359, 80–83 (2018). Hughes, T. P. et al. Nature 543, 373–377 (2017).